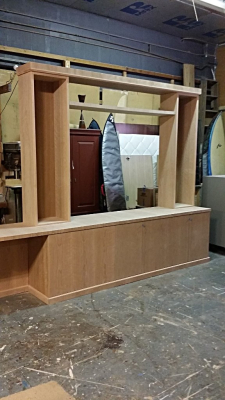 Here is a sample of some of the cabinets and furniture that we have built. There is variety here, but also consistency, in quality and attention to detail, which makes a project come out well. 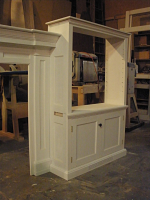 Fireplace Mantel with Cabinets. Flat panel doors below, open adjustable shelves above. Painted finish. Left: installed; Right: under construction in the shop. 2012. 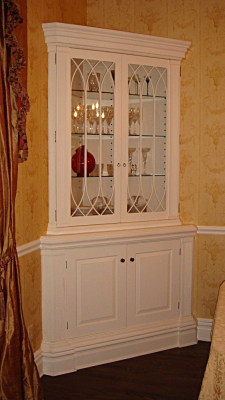 Corner Cabinet, 48" x 87" Raised panel lower doors, glass upper doors, Painted finish. One of a pair. 2004. 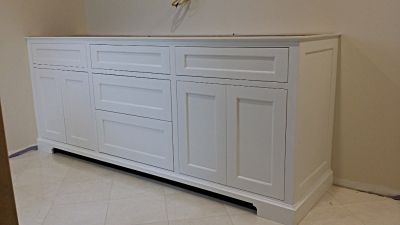 Built in Armoire Cabinet durring construction. 36" x 87". 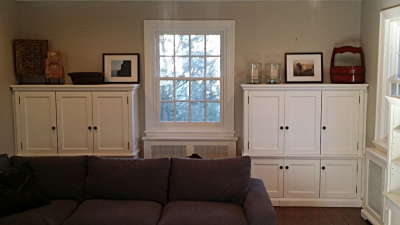 Raised panel doors above, two drawers below. 2015. Computor Desk/ Home Office. Large desk surface with plenty of room. Lower section with file drawers and concealed access to computor equipment. Cherry. Above: installation; Below: under construction. 2014. Bathroom Vanity. 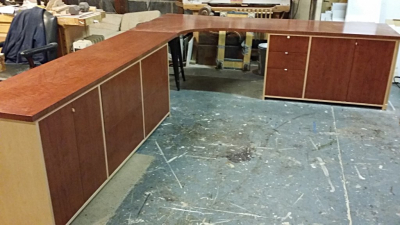 Flat panel doors; three drawers in the center section. Painted finish, 2014. 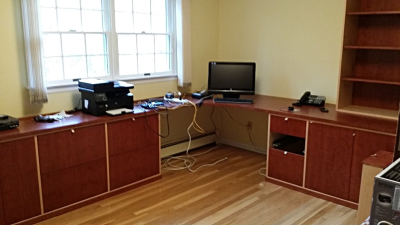 Entertainment Center with Computor Desk. Slab doors below, with accomodation for printer and adjustable shelves within for storage. 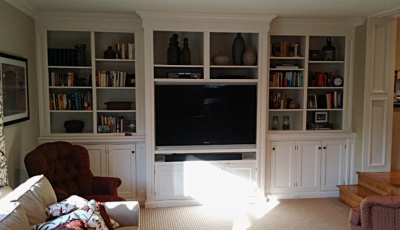 Open shelves above, with center section to mount Flat Screen TV. Cherry. Left: Installed; Right: under construction. 2015. 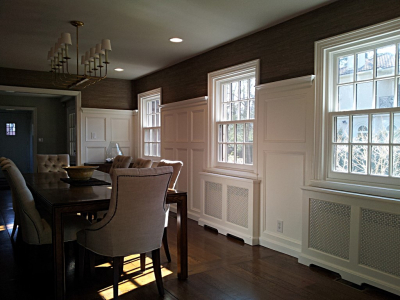 Dining Room Wall Panelling and radiator covers. Four walls to a height of 68". Frame and panel construction. Painted finish, 2010. 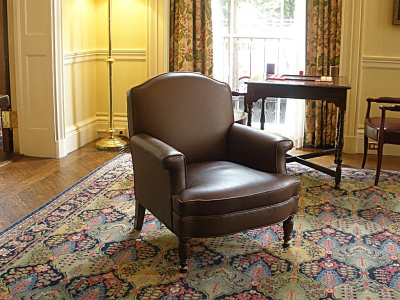 Leather Club Chair, Knickerbocker Club, NYC. One of eight, 2002. 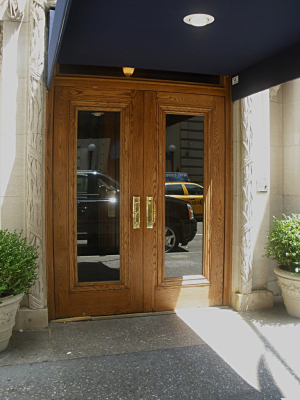 Front Entry Doors, New York Yacht Club, NY. NY. 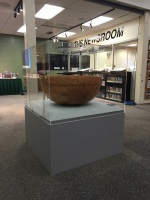 Quartersawn Oak, Glass panels, marine varnish finish, 2008. 52" x 52" x 22". Linen surface for the sculpture, Painted case, 2014. 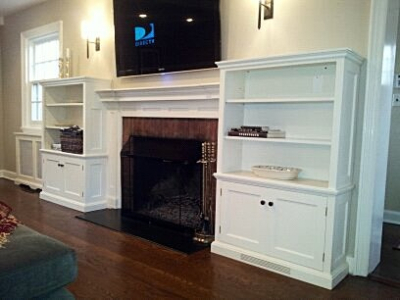 Entertainment Center Wall Unit. We built this twelve years ago before flat screen TVs became widespread. 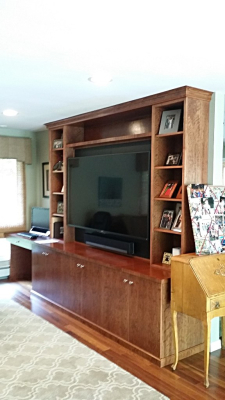 Recently, we retro-fitted the center section for a new flat screen TV with a shelf for the sound bar and doors below.